With the huge turn-around of personnel at Liverpool Football Club this summer, Brendan Rodgers now has a largely different squad to manage than the one which he led to second place in the Premier League last season. Despite the loss of Luis Suarez to Barcelona, the playing staff at his disposal are of a much higher standard overall and the sheer quantity of top players at the club now present a serious headache to Rodgers and his fellow coaches. We await to see if the significant funds brought in from the Uruguayan’s sale have been spent wisely, but on paper he certainly seems to have carried this out to perfection. Possessing top notch cover all across the pitch was always going to be vital should Liverpool want to mount a challenge on all fronts this campaign but, as I examine below, picking a line-up for each match is hardly an easy task. The names and formation chosen by Rodgers from week to week will not only be dependent on fitness levels and injury, but he should also have the luxury of varying tactics to combat the opposition’s set-up. As the transfer region has not yet reached its conclusion, the players available for selection can of course still change. On one hand, I cannot imagine that Brendan Rodgers has the ambition to bring in many more names to his squad, having made nine high profile additions already. However, the line-ups I have compiled below come from my best estimates at the players who will remain at the club come September. For example, likely departures such as Fabio Borini and Kolo Touré have not been considered. This formation and combination of personnel would be most effective against opposition employing a 2-man central midfield partnership or with a back three. Liverpool’s midfield trio of Gerrard, Henderson and Can would both physically swamp their opponent’s in the middle of the park if they only had 2 in that region, and have the technical ability to out-pass them too. Furthermore, attacking a back three would often present the opportunity for Sterling and Markovic to use their outstanding pace down the outside of the defence, in behind an advancing wing-back. One of the most immediate selection issues facing Rodgers is being able to find a way to get both front-line strikers on the pitch at the same time. While neither Daniel Sturridge nor Mario Balotelli are limited forwards, confined only to the region of the 18 yard box, both do have a preference of playing primarily down the middle. As we saw last season in particular, Sturridge possesses the game awareness to rotate positions as part of a front three, capable of filling in on either flank. However, you would have to say that whichever out of the pair is fulfilling this role at a certain time will have their attacking threat somewhat nullified. Liverpool’s manager would want to avoid this if at all possible, with their prowess in forward areas having become a hallmark of Rodgers’ style at Anfield. 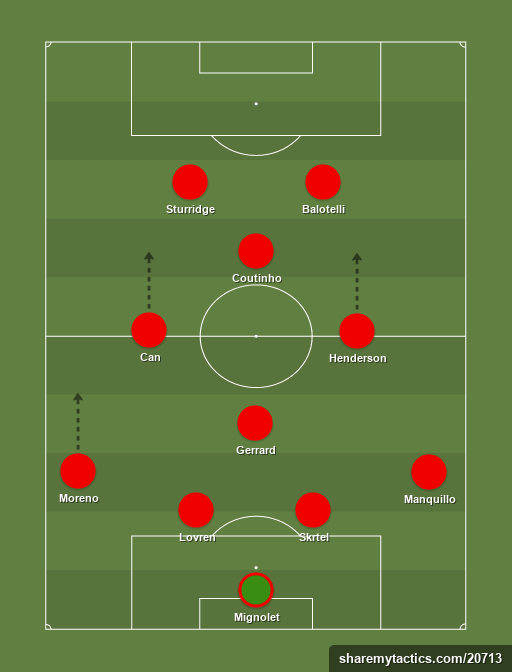 The formations below demonstrate separate examples that accommodate both Sturridge and Balotelli down the middle and perhaps will be options that Rodgers chooses to side with more often than not. However, the 4-3-3 formation has been a fruitful one for Rodgers and Liverpool; especially last season, and I am sure he will still be urged to employ it again over the coming months. In my opinion, the strongest and most stable back four picks itself and fitness permitting, this should feature heavily in most games. Manquillo and Lovren have already impressed me and seem to be a great deal more reliable than Johnson and Sakho respectively. As much as I admire the Frenchman’s lion-heart approach to defending, my heart does skip a beat every time he gains possession. The class and technical prowess of Steven Gerrard dovetails perfectly with the boundless energy of Jordan Henderson and Emre Can. They both have the ability to run all day, hopefully swamping the opposition midfielders and denying space. Raheem Sterling has grown from occasional substitute to first team must-start and as such will always find a place in the side. I look forward to seeing what Lazar Markovic can offer the team and still have the faith in Daniel Sturridge to be Rodgers’ main-stay in attack if he decides to play with only one front-man. Brendan Rodgers began to use a 4-1-2-1-2 system much more frequently towards the latter end of the last campaign and a succession of victories with this tactic certainly served to cement his approval of future use. Last season, it allowed him to play both Daniel Sturridge and Luis Suarez in more central attacking areas, with either Philippe Coutinho or Raheem Sterling picking up pockets of space between the midfield and defensive line. In the hope that a natural understanding between Sturridge and new club maverick Balotelli forms quickly, Rodgers will again have this formation up his sleeve. It may well prove to be the case that he chooses to begin a match with a different set-up, only to revert to a 4-1-2-1-2 when in search of a goal. It can also be defensively solid when the wider midfield players tuck in and therefore could be an option to retain a lead. Simply by its nature, a 4-1-2-1-2 formation is quite a narrow one generally and so the full-backs on display are vital to its effectiveness. They need to both provide the necessary width to push back the opposition whilst also be aware that 2 versus 1 situations could occur relatively frequently when defending. I believe the system works best when the two wider midfielders have tremendous energy and the desire to get up and down the pitch as they must fill in several roles; helping their full-back, reinforcing the holding midfielder and providing support to the strikers. When used correctly, intelligent and mobile players can shift across the pitch as a unit and overload certain areas at specific times, allowing for breakthroughs to be made here. Marauding opposition wing-backs in a 3-5-2 could prove dangerous however, and I would foresee limited success for Rodgers’ side if he persists with this idea against such a team. However, the very fact that he is able to deploy two front-line strikers means that an opponent’s back-line will be kept occupied at all times, making playing out from the back quite difficult. The player at the tip of the diamond can become a crucial cog if he finds enough space and possesses the quality to cause damage with it. Lallana, Coutinho and Sterling all fall under this bracket and it is a tough choice for Rodgers as to who he would choose in this position. As a staunch admirer of the continental style of football, Brendan Rodgers’ teams are generally not sent out in a 4-4-2 formation, however I do feel that it could have its place at Liverpool in the coming season. It is a fact that an aging Steven Gerrard simply cannot play every game anymore, and such a typical English set-up could be employed when England’s previous captain is being rested. He no longer possesses the legs to be part of a midfield pair, however Liverpool are certainly not short of this asset in that area. Henderson and Can are capable of running all day, and Joe Allen is no slouch across the ground either. It is unlikely that Champions League competition will be the stage to see this 4-4-2 approach, as European sides almost always set up with three in the middle of the park. Rodgers would certainly not want to give anything away in the midfield on such important occasions by sacrificing an extra man to the opposition, Liverpool would run the risk of being engulfed. Losing the midfield battle sets you well on the way to a defeat. However, some Premier League sides that The Reds will encounter this season have still stuck to 4-4-2 and so were Liverpool to match them in this regard, it would be down to their quality to shine through. Rodgers has a great deal of faith in the ability of his squad and so while it may not be used regularly, this formation is certainly an option. The freedom to start with both Sturridge and Balotelli, and to play with two genuine wide men could be just what is needed in some instances. At the beginning of his Anfield reign, Brendan Rodgers did experiment with a 3-5-2 formation but after a string of disappointing results, the idea fell by the wayside somewhat. It was the belief that Liverpool had the perfect personnel to pull it off, but once Jose Enrique became hampered by several long-term injuries in succession and Glen Johnson’s form fell off a cliff face, this opinion had no significant backing. Now however, it can be argued that they are in a better position than ever to implement the same style brought to Manchester United by Louis Van Gaal. The Anfield club have the perfect wing-backs in Manquillo and Moreno, a balanced trio of centre-backs with the addition of the composed Lovren, and a glut of technical midfielders to cause the opposition problems. Changing to a system with three at the back would certainly take a great deal of adapting to, as Van Gaal is proving at Old Trafford, so realistically I don’t see Rodgers going with a 3-5-2 in the immediate future. It is a dangerous plan to place players outside of their comfort zone but I am confident that with some time put in on the training field, Rodgers has acquired the right kind of players that could slot into any system. As can be seen above, Brendan Rodgers possesses a strength in depth previously unknown to him at Anfield. Realistically, he can field two sides who could be in contention for a top four finish and with a group of players such as this available, you would have to feel that Liverpool can challenge on all fronts. As long as their performance level is up to standard, they can do themselves justice most notably in the Premier League. With able replacements ready and willing to come in at a moment’s notice, a continual rotation policy can be used to good effect and maintain fitness throughout the season. With all the options that are at his disposal, it is nearly impossible to predict not only who takes their place in Brendan Rodgers’ strongest starting line-up, but also what formation to expect from week to week. This unpredictability can only hinder the opponent’s chances to prepare fully and as long as Liverpool’s own players have a complete understanding of the system employed, the fluidity of movement should go on to cause other teams no end of problems. Utilising his squad to its best ability will give Liverpool’s Northen Irish man at the helm the strongest opportunity to achieve the club’s goals this season and progress in every competition available to them. If you were in Brendan Rodgers’ shoes, what would your strongest line-up be? How many ever-presents do you foresee this season, and are there any systems that have not yet been trialled but you feel would fit Liverpool’s players perfectly? Let us know in the comments or on twitter @TBRFootball .